Announcing Evotri - Hub Endurance Sponsorship! Team Evotri is excited to announce a new sponsorship collaboration with Hub Endurance, Chattanooga, TN. Hub Endurance is Chattanooga's premier multisport shop and also offers a full range of custom multisport coaching options. "The Hub" is the only bike shop in Tennessee to offer professional bike fits utilizing the state of the art Guru Dynamic Fit Unit. Hub Endurance also carries Evotri's favorite line of tri bikes: Quintana Roo! Hub Endurance will provide a year of custom coaching and a professional bike fit to all new Evotri members. In addition, Hub will offer discounted coaching services and products to the full Evotri team. Team Evotri's tagline has always been "Synergistic Multisport" and that concept is something we take seriously. Synergistic Multisport means that we are always looking for new and innovative ways to interact with our sponsors and supporters. We don't just expect to be given great equipment, but also to dialogue with sponsors about how that equipment actually performs from month to month and year to year. In the past we have had sponsor representatives train and race alongside the team. Evotri's yearly WIBA training weekend is a free event to anyone who wants to show up. So when Andy Sweet (brother of Evotri member Chris Sweet) started a coaching company and multisport shop this new synergy was a no-brainer. Below is a Q&A with Hub Endurance owners Jamie Ingalls and Andy Sweet. Tell us a little bit about your athletic backgrounds. Jamie Ingalls - Former division 1 ski racer, and semi-pro cyclist. 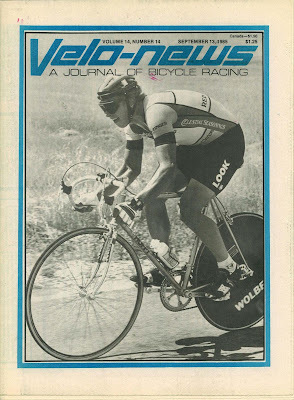 Been racing bicycles since 1988 (age 13). Andy Sweet - 5-time IM finisher, UMCA RAAM qualifier, competitive swimmer since age 6. Hub Endurance originally started out as a physical location for your coaching business where you could do bike fits and indoor group rides. Pretty quickly you guys realized that people wanted a lot more. Tell us about that transition from a coaching home base to multisport shop. How has it benefited the coaching side of your business? The biggest benefit is that it allows us to better care for and equip our athletes for optimal performances. Upon the growth of our coaching business, we quickly realized that most of our athletes were riding improper equipment and were getting frustrated with the process of trying to find/buy the right products. We started bridging that gap with information and recommendations... then eventually clients started asking us to 'just get me what I need!" In addition, Chattanooga never had a retail location dedicated to the multisport athlete (no swim shops, few bike shops with tri bikes, etc); so we decided that with our bike and retail knowledge, we could attempt to fill that gap. 10 years ago there were literally only a handful of serious triathlon coaches in the country, now USAT certifies big classes of new coaches every few months. How does Hub stand out? What are your coaching philosophies? We focus on forming and maintaining very open lines of communication with all of our clients. We encourage our clients to call/email/visit with us as often as they can, because the more direct interaction we have with them, the better we are able to assess their fitness, their health, their motivation, etc. We believe coaching is much more than providing workout schedules. We feel that we have a responsibility to our athletes to help them progress in all aspects of their fitness, which includes important (and often ignored) aspects, such as form, technique, mental preparation, and stress management, in addition to strength and endurance. We believe in helping our athletes balance their schedules to optimize fitness gains in a realistic amount of time. We realize that most people have full-time jobs, families, and other commitments outside of athletics, so we constantly strive to help our clients maximize the time that they have available, rather than asking them to sacrifice other aspects of their life. Your "Advanced" and "Professional" levels of custom coaching offer quite a few perks you don't usually see from other coaching companies. What are some of those "extras" that you've built into your coaching packages? We offer features like regular power/HR reviews, which generally other coaching groups charge extra for, because we feel these are essentials for athlete progression. We love going through files with clients, because the more that they understand their performances (strengths/weaknesses), the better athlete they will become. As a full service bike shop, we are also able to offer some other perks, such as discounted bike service/camps/clinics. Hub made a substantial investment in a Guru Dynamic Fit Cycle (DFU). Tell us about what the DFU does and why you chose it over other fit cycles / systems that are out there. The GURU Dynamic Fit Unit is far and away the greatest fit tool designed to date. We researched all the different offerings in the fit world, and were simply blown away by the DFU's capabilities. It allows us to adjust rider position in real-time (no gettting off and on the bike, swapping components, etc), while providing detailed feedback on the riders performance. It allows us to measure aspects such as power output, efficiency, spinscan, right/left leg balance, and even torque angle. After a DFU fit, we are able to provide customers with their optimal position, bike geometry, and component choices. What is one thing that absolutely drives you nuts about triathletes? We find that triathletes are very involved in researching their sport, however, they are not always the best at finding factual, supported information. They love internet forums! Outside of the family relationship, what made you want to sponsor the Evotri team? Was it the across-the-board good looks that would enable any Evotri team member to be a Hub Endurance poster child and drive gobs of business to the shop? Looks are everything! But, in all actuality, we are really looking forward to working with the Evotri team to help us announce HUB Endurance to the nationwide public. We have been extremely successful in growing our business locally and regionally, but feel that our coaching structure and talent will be able to help athletes all of the country. Through Team Evotri's large online presence and nationwide following, our partnership will highlight our remote coaching abilities. Evotri plans to visit Chattanooga next spring for a team training camp. What local ride/run routes will you be sending them on? Will anyone cry? They will all have the opportunity to train in the mountains and valleys around Chattanooga... the number of classic ride and run routes are endless. But, the infamous 3-State 3-Mountain ride will likely be featured... some will cry. P'licemen and lamps as well. History was one of my undergraduate majors (literature was the other) and continues to be one of my abiding passions. Naturally, anytime that I can bring my passion for history together with my passion for cycling I'm like a little kid on Christmas morning. This tandem restoration project has been quite a few years in the making, but before I get to that there is another bit of historical trivia that relates to the inspiration behind the original Daisy Bell song. As the story goes, when Dacre (an English popular composer) first came to the United States, he brought with him a bicycle, for which he was charged duty. His friend joked, 'It's lucky you didn't bring a bicycle built for two, otherwise you'd have to pay double duty.' Dacre was so taken with the phrase 'bicycle built for two' that he decided to use it in a song. I haven't been able to pin down a date on the bike itself. It is definitely late 50's or early 60's. The first time I saw a picture of one of these I fell in love with it. To me, it is just so iconic of that era. The cars and bikes from that time period both had gorgeous curves with barely a hard angle anywhere. So obviously the bike is good old American steel and quite heavy. I had saved searches set up on Ebay for years before I finally found this one within a couple hours of home. Actually I bought two bikes, neither of which was actually in working order. Both had been stored outside for some period of time, been repainted with probably a can of spray paint and were just generally abused all-around. Since I knew I didn't have time to jump right into the stripping and painting (I had just started a new job and was in the process of buying a new house and selling the old one) I took parts from both bikes to make a franken tandem that sort of worked. It was lots of fun to cruise around on, but the handling is complete crap and the gearing was too high. This is one of the only pics I took of the "original" frame. Fast forward a couple of years and a friend had found me an original chainguard in excellent condition to repaint. I thought this was as good an excuse to buy a sandblaster as any, so I picked up one of those and started the hard labor of removing multiple layers of paint and rust. There were so many problems that I just took everything back down to the bare metal. Originally I was going to dredge up my rusty and dated automotive painting skills, but decided if I was going to put this much time and effort into the project that I wanted a professional paint job with modern paints. Enter Mike's Collision Center. Mike Mavec is a local triathlete and owner of Mike's Collision. He had just begun dabbling in bike painting and I approached him with the tandem project. We made a deal to swap a paint job for some coaching-related services. The pinstripes I am adding in these pics were not original, but one of my personal enhancements! Don Fogler of Fogler Signs did a great job helping me re-create the original decals that all went under the clearcoat. After painting, decals and clearcoating it was time for rebuilding. I was only able to salvage a few of the original parts. The chainrings and seatposts are original but that's about it! I was amazed at how cheap heavy steel parts are! The new wheelset cost $45 and the fenders were like $20. Refreshing since a single tire for my triathlon bike runs about $75! Getting everything to work took some tinkering. The fenders and tires are both wider than the originals, but I love the look! I still need to do some tinkering with the idler pulley that maintains chain tension. The new bike's maiden voyage was a trip of a couple miles around Lexington. We live right off old Route 66 and Cara and I did a portion of the ride on the old road that is now a bike path. It seemed so iconic to be riding a classic 1950's American steel frame on the classic highway from the same era! Really looking forward to having this bike to cruise around Lexington on! Maiden Voyage! No parts fell off! So the bike basically handles like crap. It has a flimsy front fork that has to provide direction for a 50+ pound bike plus two riders. Little spooky, but the thing isn't meant to go fast! The only brake is a coaster brake which is pretty effective actually. I haven't had a bike with a coaster brake in probably 20 years, but it was amazing how natural that braking motion is if you grew up riding old school bmx! Those of you with short cycling memories probably only associate Huffy bikes with their current line of garbage department store bikes. In the 1980's Huffy invested heavily in supporting professional U.S. cycling and developing cutting-edge race bikes. The 7-Eleven cycling team rode Huffys for a few years that were actually re-branded Serottas (Huffy made their own copies for the average racer). In the 1984 and 1988 Olympics athletes aboard Huffys took home gold and silver medals. Huffy even got into developing time trial bikes and eventually triathlon bikes. 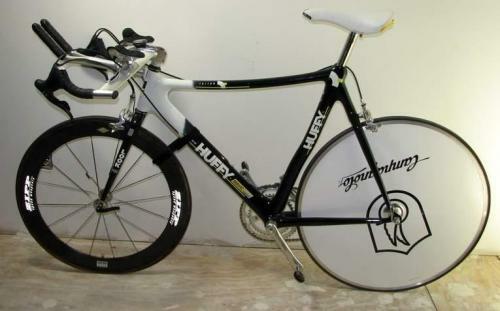 Mark Allen's 1991 win the Ironman World Championships in Kona was aboard a Huffy Triton (pictured below). Mark Allen won Kona in 1991 aboard one of these! So what's the next project, you might ask? Well I've got something at least equally as cool as the Daisy Daisy in the works: an Evel Knievel 10 speed! As far as I have been able to determine this is one of the first production bikes to be equipped with a disc brake! Check out the video of the man selling these bikes! Mine is currently in considerably worse shape. When I have this thing done and find a stars and stripes jumpsuit to match, I am going to be so badass!